Four runners at the ‘Bool on Wednesday including Yesterday’s Songs back for another tilt at the Wangoom. Yesterday's Song (pictured) won the race in 2016 and finished fourth last year. The seven-year-old made ground to finish fourth first-up over 1100m at Bendigo on April 7 and Mike Moroney has deliberately kept him fresh. “It’s his third go at the race and we’re really happy with him,” Moroney said. “His work has been good and his recent jumpout was terrific. “He’s a happy horse at the moment and kept him ticking over. “It looks as though being drawn out is not too much of a disadvantage and he could just end up camped behind them to the turn and then it’s up to him. Patrick Moloney is aboard Yesterday’s Songs who will jump from barrier 12. Saracino has drawn one from the outside in the Wangoom with Corey Brown in the saddle however, Moroney is not overly concerned. “He’ll go forward and he’s best when he does go forward,” Moroney said. 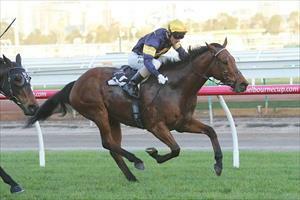 “His last jumpout was excellent and there is some give in the track which will suit him. Bianco Nuovo is in race three, the 3YO Maiden Plate over 1700m with Patrick Moloney to ride. The son of Artie Schiller is fitter for two runs this preparation and will appreciate the step up in distance. “It looks an ideal race for him and there are Super VOBIS bonuses attached,” Moroney said. “He’s trained on well and he just keeps improving. He ran on well last start after being slow away so ideally we’d take advantage of the barrier. Born To Fight runs in race six, the 3YO Benchmark 70 Handicap over 1400m with Patrick Moloney to ride. “He’s struck a very strong race with city form in it,” Moroney said. “We’ve always had a good opinion of this horse and if you went solely on his work you would expect him to go close to winning.